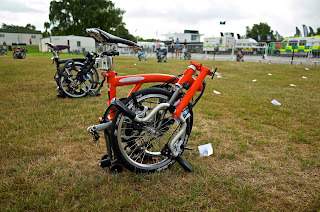 My Orange Brompton: Brompton World Championships 2013 - Awesome and then some! 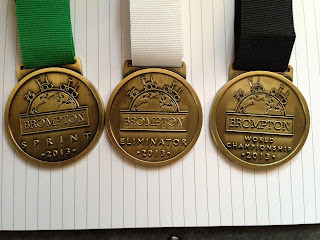 Brompton World Championships 2013 - Awesome and then some! Some of you may be wondering why I am using the word awesome? 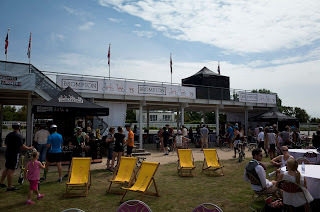 It is perhaps not a word that trips off the tongue easily for yours truly but I had to use this adjective to give you an idea to describe the Brompton World Championships. 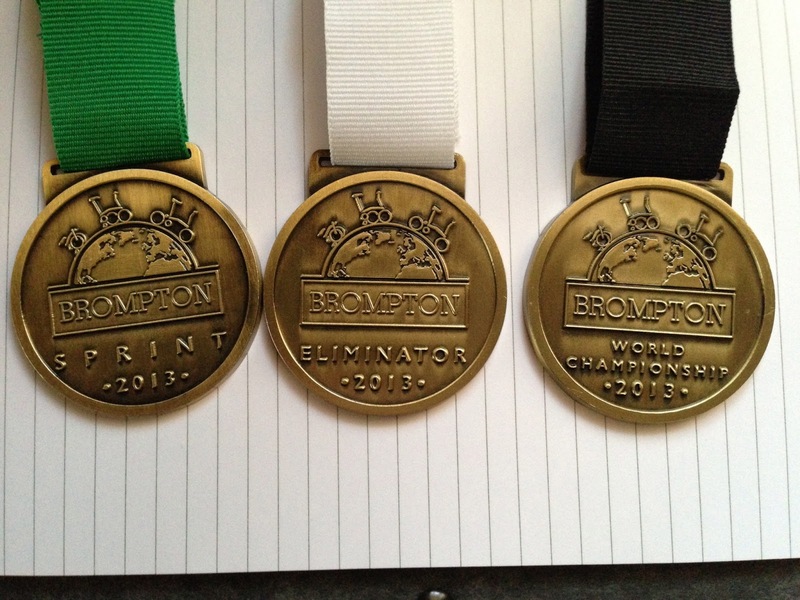 As many of you how read my blog know I entered what is called the Brompton Treble. Two of these events took place yesterday with the Brompton World Championships taking place today. 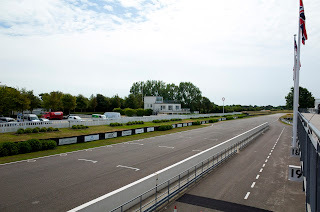 I arrived at Goodwood Race Circuit early as I wanted to avoid traffic. Registering brought home the realities of what I had done. The Treble is definitely not for the faint of heart but occasionally being made of sterner stuff I decided all those months ago that the Treble it would be. My race number which had a timing chip attached to the back was cable tied to the front handlebars of my Brompton and I proceeded inside. 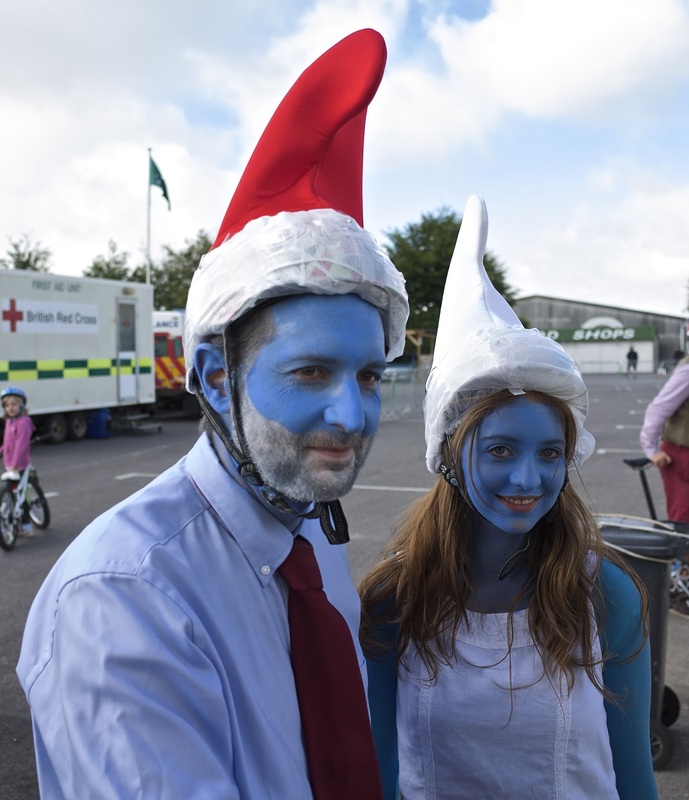 I was soon greeted by a few friends some who had come to watch and others like me embarking upon the Treble. Heavy rain had been forecast for Saturday but it only started to rain when I was making my way home. The sun was out burning off the initial cloud that drifted gently by. 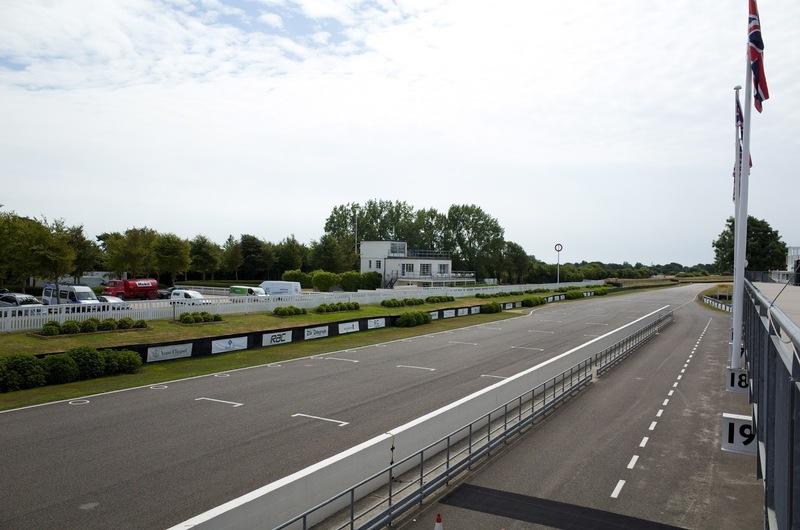 We were allowed out on to the famous track for a few laps. I was very grateful for this opportunity as familiarising oneself with the lie of the land is always a good thing. I cycled at pace and luckily for me my left knee didn't seem to be complaining too much. I could feel that it still wasn't 100% but it was pretty close to it. I found the circuit very agreeable and was enjoying myself. By the time I had completed my third lap I had just about figured out where I'd have to put the power in to get over a gentle but sustained incline. I took care getting clipped in and cycling off. The knee felt okay so I made it work a little harder. I found myself out in front for most of the 500 metres or so. Towards the end I was passed by a couple of riders but I felt I'd put in a good performance. Laurence a bit of a Jedi Master was in this race and was the fastest Veteran for the heats! He went into the final later on and looked to be in good form!! A medal was placed firmly in my hands by an ever enthusiastic member of Brompton staff and I hung it proudly over one of my handlebars - which seemed the done thing. Regular readers will know that I love receiving a medal and it just makes an event more memorable. After this we returned to the paddock to chew the fat for a while and await the Eliminator, the second of the three events making up the Treble. The Eliminator was an unknown. It had a few of us nervous. Riders would go off in a group of 20 and all complete the first lap. At certain points on the second lap the last two riders would be told to back off their pace by a motorcyclist. There would therefore be only 6 riders who would complete both laps at full pace. There were lots and lots of exhibitors and companies showing off their products. One familiar face was the highly talented artist Zabou who was just starting her live painting of 6 portraits of Brompton riders from around the world who had submitted their photos online. Once completed I believe the artwork will go on display at the Brompton factory. It was good to see Zabou and her work again. 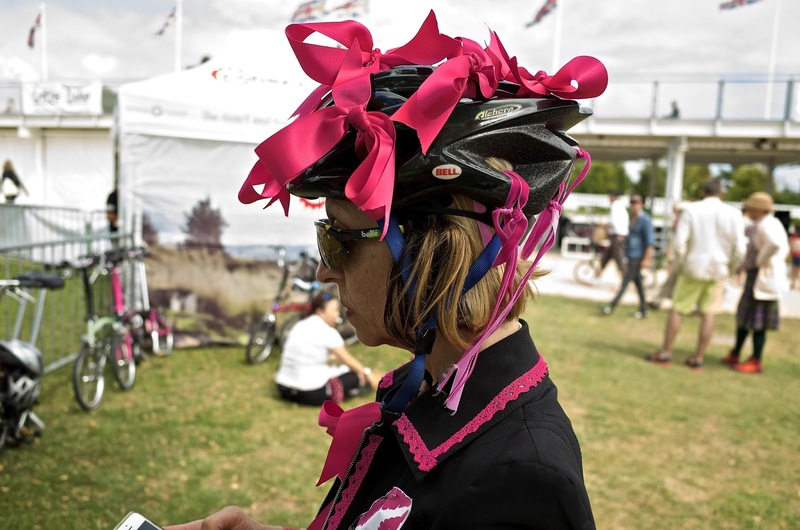 She is a familiar face on the IBikeLondon rides, one of which featured her work. One of the paintings is going to be of my friend Ian and I think he was pleased about it! In the Brompton area the prizes for the fastest male and female were on display and my eyes were drawn to the medals. Lovely isn't it. For a few brief seconds I fancied that I could win that there medal. Reality is a cruel mistress. It soon dawned on my that to have this placed around my neck I would not only have to give up work but somehow engineer a secret motor to power my Brompton. Soon we made our way to the start of the Eliminator. With the rules clearly explained we got ready. My mouth felt dry. My heart pounded slightly and soon it would all begin. We were given the go and we were off. The front riders went off at a tremendous pace and were soon so far ahead that catching them up would be impossible. 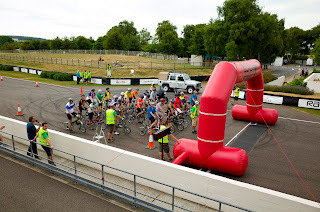 My aim therefore was not to be the first person to be eliminated as I crossed the line for the start of my second lap. I got about 3/4 of the way round the second lap and I turned to see the riders behind me slowing their pace as the motorcyclist referee came alongside. I had at least succeeded in my primary aim. By the time the motorcyclist came up alongside me I knew my fate. Like an Officer in WWII, for me the war was over. I cycled back to the start/finish line and was given my second medal by a happy Brompton staff member. I was very pleased!! Two medals. I watched a few of my friends compete in their Eliminator races before saying my goodbyes. 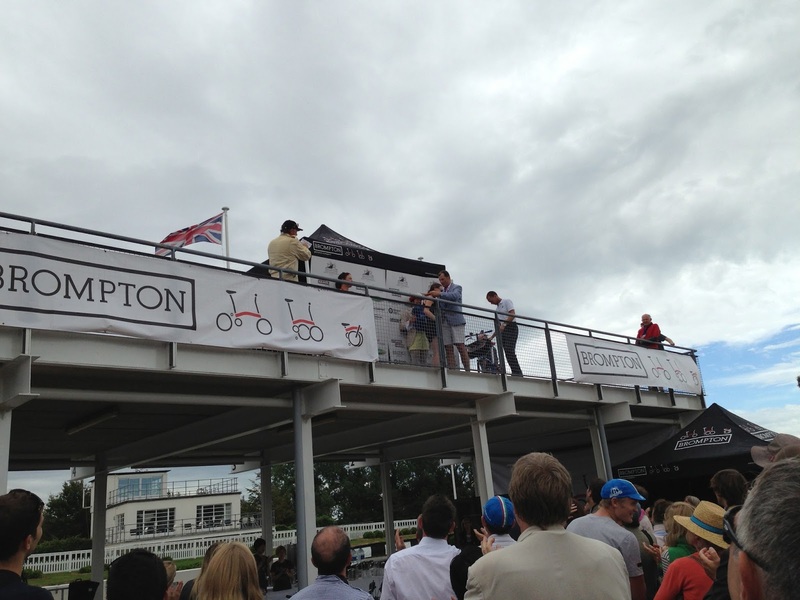 Day one of the Brompton World Championships was brilliant. I throughly enjoyed it and looked forward for more! I didn't wait long as today was the big one. This is the cycling event I had been gearing up for...training all year for. The Brompton World Championships is the greatest cycling event bar none. Well...the Tour de France isn't bad I suppose but apart from that this is it! Upon arrival I was greeted almost instantly by a friendly gentleman who had come from Germany for the race. 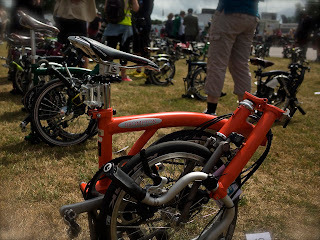 He had parked next to me and he soon established that I was Orange Brompton. He kindly said that he was aware of my blog and took a photo of me. Heading towards the paddock area I saw lots of friends from the Brompton Club. It was great that we were out in force. There was much discussion about the circuit and before long we decided to place our bikes on the start grid. I was one of the first in my group to do so and it looked as if I'd be in the first wave to go! As we waited for the safety and instructions talk I saw some rather fabulous outfits and bikes. Many had put a huge effort into colour coordinating their bike to their outfit. I thought everyone looked great. One particular couple stole show for me. The two Smurfs looked wonderful and the lady Smurf in particular had the best outfit for me. I must confess to being a little unnerved by this but soldiered on. As I walked back to the start line, from which we had to run to our bikes (more of that in a minute) I strolled a little taller as quite possibly spectators might view me as a serious contender as I was in the first wave of riders. We waited. I waited. Before long the air horn was sounded and we were off. Now, as I have written before a gentleman doesn't run and as such I walked to my bike as if I were partaking in the gentle stroll in the Cotswolds. I reached my bike, unfolded and moved towards the start. Pressing my Garmin Edge 510 as I passed the timing mat I was off. I knew that heading off too quickly would be disastrous. This was a long and demanding circuit. It was fast! It was also windy and I knew that this might be a problem. I passed several riders and was desperately trying to find someone to draft. The problem I found was that there were riders either too fast or too slow. I eventually found a gentleman wearing a silk scarf who was just about faster than me. We began to use each other. At times he would be ahead and I would be up at his rear wheel and vice versa. (I was later to shake the hand of this gentleman and we thanked each other. I didn't ask his name sadly). My Garmin was telling me that my average speed was hovering between a mid 18 mph and a low 20 mph. For the first couple of laps I tried to make sure it didn't get any lower. My trusty Garmin was a brilliant assistant in this regard. I think on the start of the third lap I was passed by Mark (King of the Hills) who was setting a scorching pace within a peloton of five or so riders. When they passed I joined the back and kept up with them for a few hundred metres before having to step off. It was not long after this that I lapped my partner in crime iCrazyBee. As I went past I dinged my bell and got a reply. From where I was looking my riding partner looked pretty good and was motoring along with the best of them. With the end in sight I tried to get down low and pedal as hard as I could. The race was over. Perspiration was pouring and I obtained my medal. I was rather proud of myself as I had a feeling I might had broken the 30 minute mark. The race results were out pretty soon after the last riders finished and I had beaten the 30 minute barrier and got a time of just over 29 minutes 50 seconds. I was very pleased! I was even more pleased when I realised that I had improved my overall position from last year by almost 240 places. I had come in the 160's this year. Last year I was placed just over 400! Issy won! Issy on the podium as winner! There has been some bemoaning the fact that the venue was changed from Blenheim. I don't know the details of why Blenheim was not chosen and would not care to speculate. I suspect that Brompton might have been searching for a suitable venue in a short space of time. Goodwood was a different circuit. Some people have commented that the scenery at Blenheim was better. 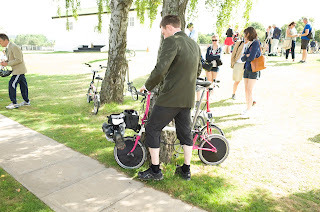 I have to say that in the two Brompton World Championships I participated in at Blenheim I was too focused on the race to be bothered with scenery. This was an awesome event! I loved it. I would have preferred it to have taken place in August. I'd love the Marathon or something similar to come back but this was a brilliant couple of days in every way. As always Brompton excels at putting on these events. 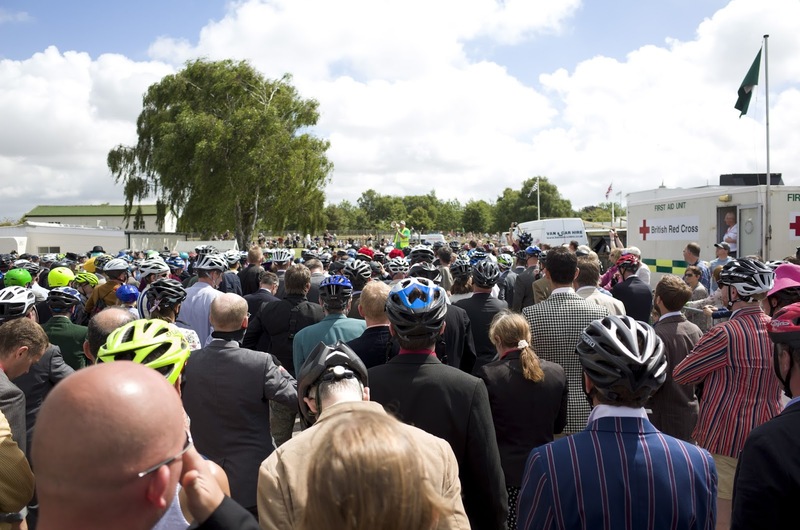 It is of course a team effort and I write the word 'team' as so many Brompton staff were out in force supporting the event. However, whoever Brompton have organising this event they/he/she are excellent at their job/s. Their partners Orbital have also done a good job. 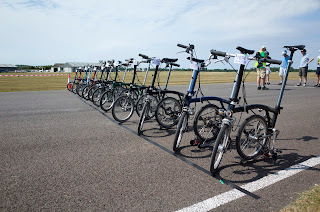 If Brompton decides to have the Brompton World Championships at Goodwood next year as far as I am concerned this wouldn't be a bad thing. 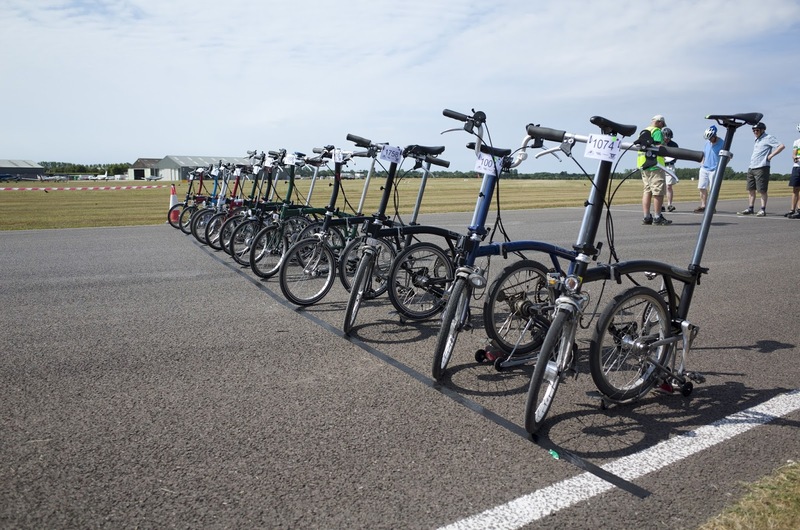 Brompton may look elsewhere in the future and this would be an exciting prospect too. 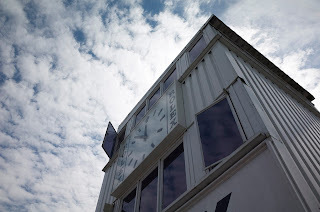 If it is Goodwood next year I will look forward to it greatly. The great thing about this event was of course catching up with friends. 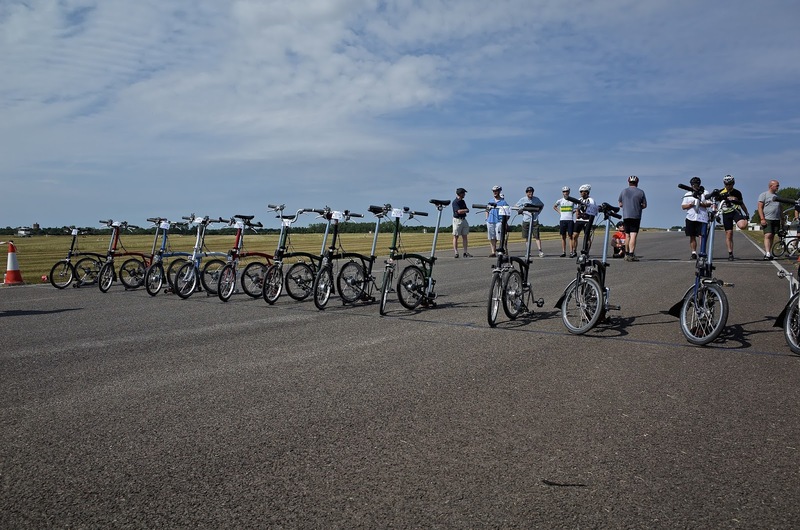 In addition it was great to meet lots of fun people from all across the world with the common ground of a Brompton Folding bike. 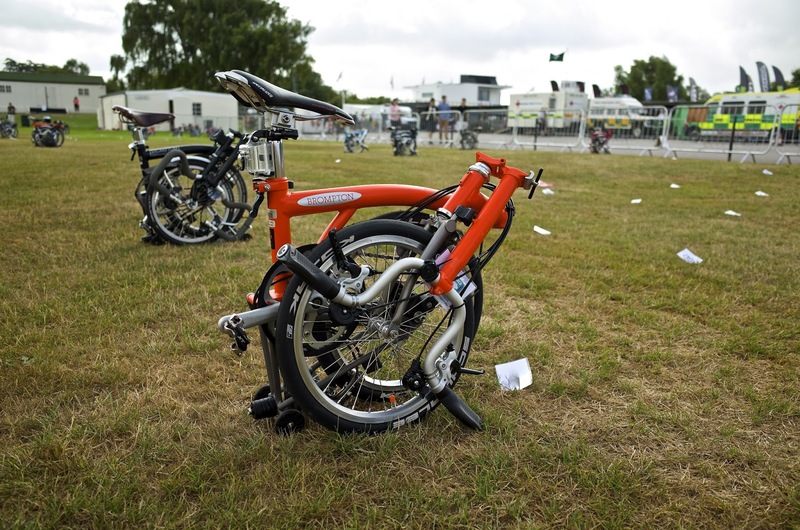 Our little folding bikes are more than just personal transport they are a conduit to fun! There is also something in what Brompton MD Will Butler Adams said when he addressed the crowd after the winners had been announced when he alluded to an event like this making bicycles in general more popular. 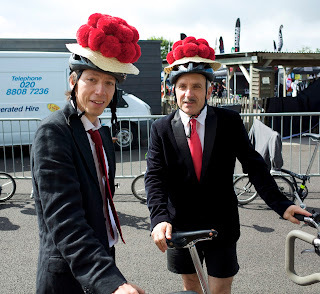 Of course with the Brompton World Championships 2013 over there is only one thing left to do! There is only one thing for us all to talk about. 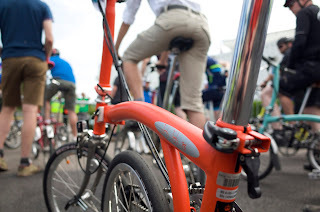 The preparation and training for the Brompton World Championships 2014, the greatest cycling event starts now!! What fun, and how exciting! And what a beautiful set of medals, too . . . I've read that Blenheim has discontinued all events catered by outside organizers, as it is felt that the costs of such events don't allow Blenheim to mazimize revenues. As the expense of upkeep is extraordinary Blenheim management is apparently focusing on those more profitable programs which they can run themselves for increased financial benefit. One can't blame Blenheim's financial custodians, and it is good to hear that so many were happy with Goodwood, but, personally, I do wish I'd made it over to your part of the world before the locale was changed. 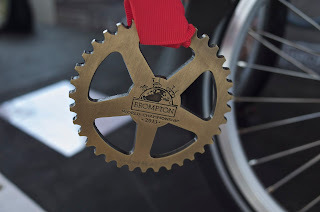 I didn't do the BWC in 2013, because of where it was, so I won't be doing 2014 either. However, if a venue nearer to Blenhiem could be found, I'd be there like a shot. I live in East Kent and my son lives in Derby. 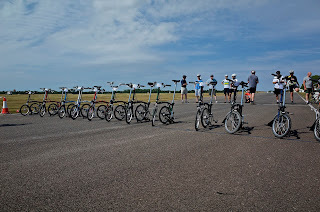 Blenhiem was a good place for a family reunion on our Bromptons.